It doesn’t matter what type of tile you use in the bathroom, soap scum can still build up on it. While limestone tiles bring an earthy and calming feel to your bathroom decor, when it’s covered with soap scum it is hard to enjoy a hot relaxing shower. 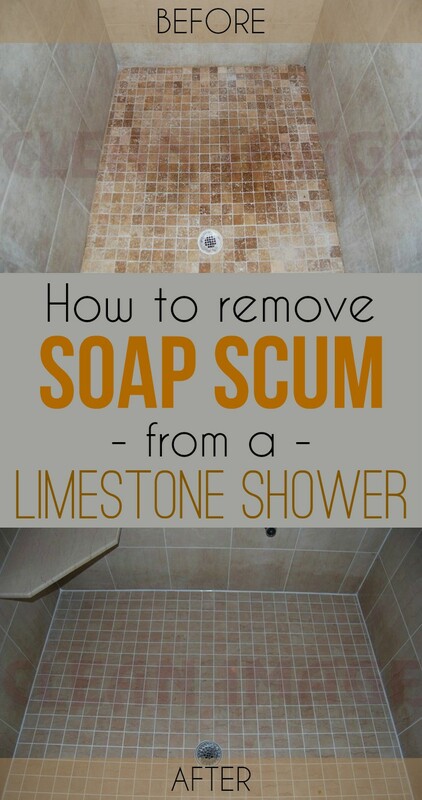 – Spray the shower with stone cleanser or non-acidic soap scum cleanser. – Cover the entire shower with the cleanser and allow it to sit for 15 minutes. – Wipe the walls clean with a damp sponge, rinsing and wringing out the sponge frequently until the soap scum is gone. – Scrub limestone mosaic-tile floors with a nylon-bristle scrub brush, as these tiles can take a more aggressive cleaning. – Dry the shower with a squeegee or chamois cloth. – Seal the shower with a penetrating stone sealer according to the package directions. The penetrating sealer protects the limestone against damage and seals the grout as well. Combine 1 tablespoon of liquid dish soap with 2 cups of water. Baking soda works as a soft abrasive to remove tough scum buildup. Apply it directly to the scrubbing pad side of a sponge. Rub the scrubber on the soap scum in a circular motion. Rinse with clean water and dry with a soft cloth. Dry the shower with a squeegee or with a towel after every use to help prevent soap scum buildup.